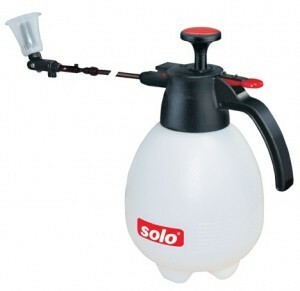 SPRAYER DESCRIPTION: This is a 2 Quart sprayer which comes with a pump built in for tank compression. It has an adjustable nozzle, a handy lock on switch for continuous spraying and a sturdy tank which will withstand long use. Pump it up and you will be able to spray over 20 feet away when the nozzle is adjusted to a pin stream. 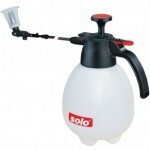 It also features the 22 inch wand with adjustable coned nozzle making it excellent for "spot specific spraying". It can hold 2 1/4 quarts and is perfect for small applications, apartment dwellers or for uncommon applications. This sprayer is capable of spraying both our liquid and wettable powder formulations. The tank is very durable and should be able to withstand years of use. TYPES OF MATERIAL IT CAN SPRAY: Most any type of material including liquid concentrates and wettable powders.